We designed the Rocky Mountain Summit™ Air Purifier with 7 stages of purification. Each unique stage has a purpose to give your home or office a comprehensive clean. Tough odors cannot hide from our Summit. The ozone feature, unique to the Summit Line, eliminates stubborn smells like smoke and cooking odors that are in the air and surfaces throughout your home. These odors are trapped in your couch, carpet, and pillows -- any porous surface including wood, plastics, walls or even countertops. You are in complete control of the ozone - You choose when you want to use it, and You choose how much to use based on square footage. The Summit arrives with everything you need to start cleaning the air you breathe. Shipping Weight: 17 lbs • Coverage: 3,500 Sq. Ft. 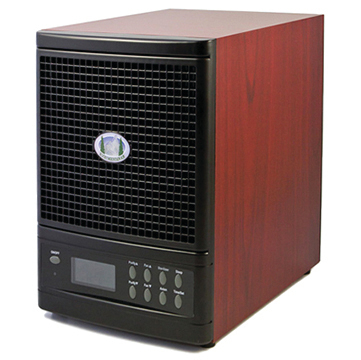 The Summit is a High Performance air purifier by Rocky Mountain Air® . Featuring seven (7) unique stages of air purification, our air cleaning system yields Best-in-Class Performance. The combination of HEPA certified, Activated Carbon, Photo-Catalytic (PCO), and Dust/Debris filtration with Ionic and Activated Oxygen (O3) purification allows our portable air cleaner to eliminate even the toughest odors (such as smoke) while destroying airborne contaminants. In fact, by utilizing multistage filtration the Summit is able to eradicate 99.99% of airborne pollutants from the air in your home. At the push of a button, the Summit's ozone feature reaches out into your home or office to destroy viruses, bacteria, mold, mildew, and odors trapped in the porous surfaces of your furniture, rugs, and draperies. Our purifier attacks these Volatile Organic Compounds (VOC's), allergens, and microorganisms from so many different angles that the air in your home becomes as fresh and clean as the Rocky Mountains! We are so confident in the cleaning and air sanitizing power of the Summit that we have backed each unit with a 60-day money back guarantee! So buy the Summit today, risk free, and rest easier knowing that your family will be breathing pure Rocky Mountain Air® . Seven Stages Of Purification: Dust & Debris Pre-FilterOur Activated Pre-filter begins the multi-stage filtration for all Rocky Mountain Air® purification systems. By trapping and filtering out coarser contaminants, the initial phase of filtration effectively removes dust, dirt, pet hair, and debris from the air you breathe. As a result, less stress is placed on each of the following filtration stages making your portable air cleaner more effective and durable. The first step in our filtration process is just as important as the last and so Rocky Mountain Air® made certain to create a Pre-filter that is easy to clean and as durable as the unit itself.